Cañuelas has been a popular brand in the market for three decades, and is synonym of high quality products with affordable prices. We began producing Flours. It currently offers 000 flour in the mass market, and also sells products in the industrial flour market. 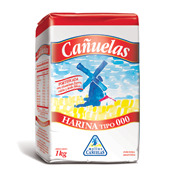 The choice of Argentine people, Cañuelas flour is present everywhere in the country.